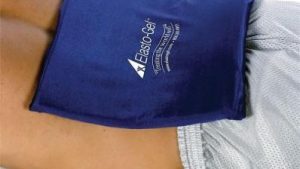 Available in 2 sizes, the Elasto-Gel Hot/Cold Cervical Support Rolls are used for hot and/or cold therapy for the cervical area while providing comfort and support to the neck in a supine position. The rolls help properly align the spine to create even more support for the back and neck. 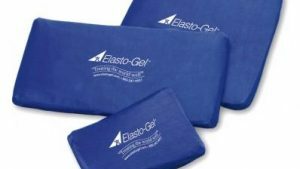 In order to help with muscle stiffness and/or soreness, use the Elasto-Gel Hot/Cold Cervical Support Roll after a few seconds in the microwave. The heat will increase blood circulation and relax muscles. Sold separately, purchase multiple support rolls to create a natural alignment of the back while using hot or cold therapies. To help with sharp pain like whiplash or muscle spasms, freeze the rolls for 2 hours or more than apply to the affected areas. “I purchased this roll for my mother, whom has neck pain frequently due to Schuermans Disease as well as Degenerative Disk Disease and a Discetomy she had some years ago. She had been going to physically therapy and they allowed her to use one in the office for the chronice headaches she was getting. Wow, does this thing work. Actually, it works so well that I almost ALMOST kept it for myself. You place the roll into the freezer for an hour or so (she stores her’s in the freezer) and then you lay on it. It’s amazing. Cold, but not ‘OMG my neck is going to get freezer burnt, do I have frost bite?’ cold. It’s nicely squishy while still being very supportive, and the large is just the right size. I’ve found myself going over to her house on occasion when I have a headache I can’t get rid of, just to use it. It certainly relaxes the muscles in your neck fairly quickly. I bought this cervical support roll to have mobile neck support when having to go to the dentist. What I found that It has far more versatility. The roll has the ability to be heated or cooled and I’ve found this to be invaluable when my neck is feeling tired and weak. I usually pop it in the microwave – then lie down for 20-30 minutes and let the support ease away all the tension and soreness. In the summer I cooled it down and got instant relief from the heat while reclining. About the only down side of this roll is that it is heavy (3-5lbs.) and that sometimes it is a bit too firm! I really have not used it lying flat on floor, but it does not get warm enough for me even after heating in microwave as instructed. (45 secs. for 1100 watts). I heated it again for 60secs. and again for 40 sec. I was excited about getting this but the first night I tried to sleep on it I had a terrific neck pain/stiffness the next morning. It is too hard for someone with cervical spondylosis as advanced as mine. I have two sites a problem: C2-C3 ~2mm and C5-C6 4-5mm and it is the nasty pain source. Perhaps also the smaller diameter would have worked and I just picked the wrong size. One feature is good, the heating/cooling aspect of the roll. A little softer and I might try again. I bought this for my neck problems. 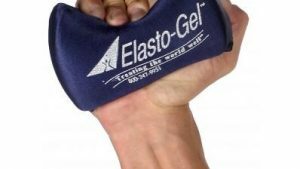 I usually use a hot water bottle but the shape of this Elasto Gel pillow is better for fitting under your neck. It is soft but firm at the same time. My only complaint is that the heat only lasts about 15 minutes and then you have to pop it back in the microwave. Still better than the water bottle though. A very high quality product. 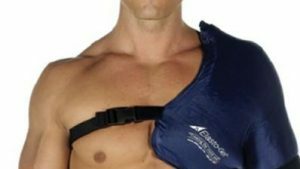 So comfortable to use as it allows a person to totally relax neck on this soft and cold cold pack. It is bigger than I expected, but that’s my fault as they give the correct measurements. A bit too big for my neck but I’ve been using it for back support. Perfect for neck stays cold for long periods of time. I ordered the cervical support roll large and they sent me a head cap. Completely wrong thing, but I did not want to go through the hassle of sending it back. I’ve offered it to a few people and everyone wonders what you’d do with an ice pack that goes over your head, ears, and wraps around your neck. It’s a freezing cold hood and it’s just taking up space in my linen closet because no one can see the utility. I will never order from here again, I wasted my money. I have 2 different sizes. The 3″ is good for sleeping, cold & room temp both work for me, depending on circumstances. The thickness does hold the cold longer than the flat gel packs. Even at room temp it retains some coolness. I wanted to try the 4″ for headache & neck pain, which works well, more contact area, although NOT for sleeping on, lifts ‘my’ head too high & using it for overnight would give me neck pain. Someone else it might be okay for sleep. Just know. What is proper alignment for you. Feels great on my stiff neck and relieves stress. Stays cold a very long time, much longer than my usual ice packs and I don’t have to wrap it in a towel that falls off a few minutes after I lay down. This is the best freezable, re-freezable item I’ve ever had. Awesome for headaches .migraines and neck pain . Just keep in plastic bag in the freezer ready to use . This is a wonderful product just like the one that the physical therapist recommended for my neck. I have used it and it really is great. I love it. Just right size the only thing is that it takes up a lot of room in my freezer. ABSOLUTELY Wonderful ! Definitely recommend to anyone that has neck problems!! Bought the larger one and regret it. Stays cold, but it is HEAVY! Takes 24 hours to chill, so you will need to have space in your freezer to be able to use it on a regular basis. I use it for migraines that come from a neck injury. It is helpful for pain relief, but not necessarily practical. The smaller one might work better. Cool even without refrigerating. Great for back or neck. I have recommended to many friends. Awesome for neck tension, best used warm, this is my second one. The last one snagged on a rough spot in the micro wave, stopped turning and over heated in one spot. Way too big and uncomfortable. This thing is fantastic! 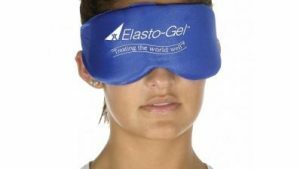 I used it the first night I received it and woke up with zero pain in my neck the following morning. My shoulder muscles were much looser as well. It has the firmness needed to hold the neck in position. Although I was worried that the 4″ would be too large, it wasn’t, it was perfect! Not very comfortable and isn’t cold enough. Used this product at my daughters and loved it. Bought my own when I got home. I love the cover on the ice pack, no need for extra protection for your skin while icing. The product is nice to have for anyone with a neck injury that requires icing. However, it does not get very cold in the freezer as my other ice-packs do. The temperature drops relatively quickly (5-7 min of use, for me). Also, according to the manufacturer’s directions, to protect the roll from damage it must be kept in a plastic bag (provided) while in the freezer. I wills say, the physical structure of the roll is just right, with a nice balance of firmness and comfort. The outer material is very comfortable.. The concept of a roll like this is 5 stars. To be more effective, developers need to go back to the drawing board and figure out how to make this colder in the freezer. I bought the large roll. This roll is too large to lay on comfortably. I love it because I use it for traction to stretch out my neck and release my occipitals. I have only used it hot, so I can’t speak to the coldness, but it does remain hot for at least 30 min. I will post pics with measurements. Love this!!! Helps a lot when I have a headache. Most of the time this is all I need to relieve my headache. Highly recommend it. “So glad I ordered the 4″” roll for ‘more’ effective supportive relief therapy. 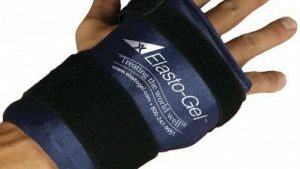 Product is a heavy sturdy flexible gel with a smooth stretch cover cool to the touch. Haven’t even done hot / microwave or cold / freezer therapy because the coolness of the roll is so nice. Great product! Its okay. I prefer ice packs with more molding ability. I have only used this a few times. 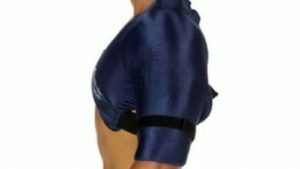 I like it, but I sure do wish the company would make a size in between this Large and the smaller Cervical Support Roll! It’s VERY heavy and not terribly convenient to carry around to dental or other appointments. Mostly use this at home. I ordered the large roll because reading other reviews I am 5’3 with a smaller neck and was afraid I needed more support to reach the shape of my neck. It was nice to be able to microwave to heat up. I have TMJ and it felt better when laying with this, but it didn’t help after I got up. I can’t lay on this all day so I am returning and will look for a different solution for my TMJ neck pain. Definite plus addition to self care items for symptom management. Arrived in time and as shown. “My husband loves this product. He has always used a cervical pillow for a past neck fusion/pain, but never had enough support. 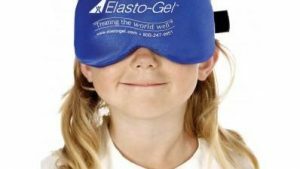 This 4″” gel pillow did the trick for him. We did worry about.the larger 4″” size, but it was perfect. He’s about 5’7, 195lbs guy and the larger one was the right choice. He just slid it under my pillow case, so still using his pillow with it. 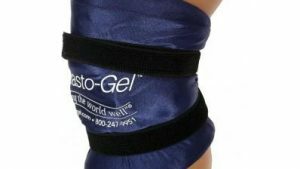 Q Is this a good product to Ice your legs/shins? 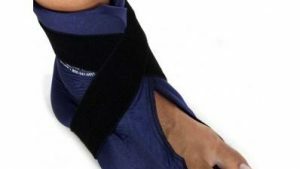 A It could work for that by resting the roll on your shins but it’s designed for the neck. Hope this helps. Q Would this help correcting neck alignment? Or just simply help relaxing neck muscle? A It does not prevent you from turning your head, so I would say it is not stiff enough to correct alignment, but may be helpful if you avoid those types of movements. I use it primarily for pain relief and the migraines that are generated from cervical surgery. For me, using it cold works best. For others, it can be used as heat. I try not to wear it at home (unless I have a migraine), but I always wear it when I am outdoors. Especially when I will be driving. It helps take the strain off my neck. Good Luck. Q Can you sleep with this overnight? A I think that is something you just have to find out for yourself. I have no problem sleeping with it overnight, but I lent it to a friend who said she could only do it for a little while before having to turn on her side. I absolutely love it and think it is one of the best things I have purchased in a while. After a long day of looking down at a desk, papers, my iPhone, etc., the neck roll seems to set things right at night. I recommend rolling up a towel to the same diameter and placing it under your neck to see how long you can sleep with it overnight. Q What is material is inside the cervical support roll? Gel? Beads?